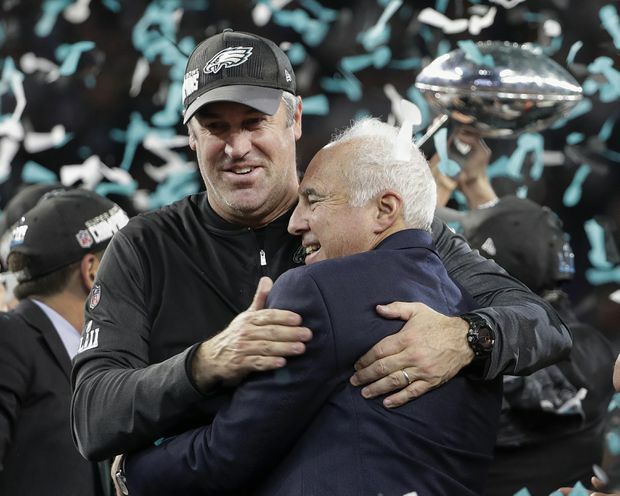 Philadelphia Eagles owner Jeffrey Lurie, right, and head coach Doug Pederson celebrate after the NFL Super Bowl 52 football game against the New England Patriots, in Minneapolis, Minn. The last time the Eagles opened a season as NFL champions, it was 1960 and, well, who remembers what folks did then in Philadelphia? What they’ll certainly do Thursday night at the Linc when the Falcons come to town is roar with approval at the site of the Lombardi Trophy and the championship banner. Fans will sing many, many choruses of Fly Eagles Fly. And then the guys on the field will get down to business, defending the title they took away from New England last February. That defence will be difficult, particularly in the NFC, a stronger conference than the AFC. “Quite honestly, it’s going to be a great night from that standpoint,” coach Doug Pederson says of the season opener. “The fans that are in attendance are going to be crazy and they’re going to be excited. It’s going to be great for the banner to be dropped in Lincoln Financial [Field]. It’s going to be a great atmosphere. It had better be, because the Falcons barely lost in Philly in the divisional round last winter, and they’ve upgraded on both sides of the ball. Atlanta, No. 8 in the AP Pro32, comes in as a 2 1/2-point underdog to top-ranked Philadelphia. Pro Picks goes out on a limb early. We didn’t stick around for too long last year, so consider that when we choose the SAINTS to win this weekend. Jimmy Garoppolo is undefeated as a starting quarterback. Streak ends Sunday. The Browns are defeated in 17 straight. That streak continues, even if Le’Veon Bell is a no-show. Almost went with this as BEST BET. Saints have Super Bowl-level talent. The return of Jon Gruden to the Black Hole. Raiders could struggle after Chucky traded his best player. Khalil Mack surfaces in Chicago. More significant: Aaron Rodgers is back at QB for Packers. Lots of people like the Chargers in the AFC West. So do we. If healthy, the Texans could be ready for special season. But they rarely play well in Foxborough. Sean McDermott didn’t want inexperienced Josh Allen at QB against this defence. Smart man. Andrew Luck returns at last. He doesn’t have much surrounding him. How satisfying will this win be for Tom Coughlin? Not feeling good vibes about the Titans right now. Not feeling good vibes about the Cowboys right now. Two of the NFL’s most mysterious teams this year. Go with the hosts. Two more of the NFL’s most mysterious teams. Go with the … you get the drill. Sam Darnold’s debut gives this game some intrigue. So does Matt Patricia’s as Lions coach.